Hi everyone! 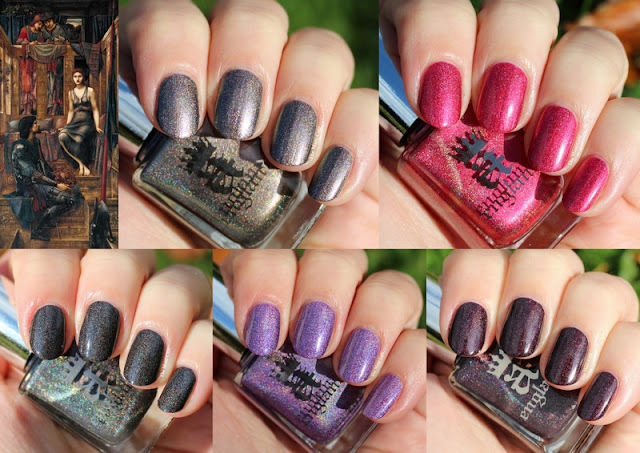 Today I'm so excited to share my swatches of the new collection from A England called Tennyson's Romance! I was recently lucky enough to visit Adina at A England HQ and see a sneak peek of the new collection and even help out with selection! So needless to say, I'm so excited to have these in my collection now. The inspiration for this collection comes from the poem by Tennyson called The Beggar Maid about a King who fell in love at first sight with a beggar maid and married her. The colours are inspired by the painting by Burne-Jones named King Cophetua and the Beggar Maid. The common theme in both works is universal love and equality with humbleness in front of love and beauty! I find it fascinating to see where Adina gets her inspiration from and you can tell that she is really passionate about her products and process of creating them. So here goes! For each colour, you'll find the beautiful description from the brand in italics and then my thoughts on each. A gorgeous velvety purple holographic. 2 coats, no topcoat. Excellent formula as I expect from A England. I love the soft velvety diffused holo effect. A surprise favourite in this collection for me. I knew I would like this shade but not this much! The metallic sheen with the holo is gorgeous. 2 coats, no topcoat. This is a really unique shade, almost black but with a green tinge. Again I like the soft velvet texture and shimmer. 2 coats, no topcoat. The colour I was most excited about after seeing it when I visited Adina. A deep and vampy wine with glowing soft holo. Just my kind of polish. 2 coats, no topcoat. I was honoured to have some input on this shade when visiting A England HQ and I'm glad to say I find it as beautiful now as I did then. This is a gorgeous glowing red which pulls a bit pink on me and I love it. Exactly the kind of colour I can wear on it's own when I need a simple mani I know I will love. 2 coats, no topcoat. As usual, this is a stunning collection from A England which completely fits the inspiration behind it. My favourites are definitely The Beggar Maid, In Robe and Crown and Shall Be My Queen. I didn't have any issues with formula and most of these were almost one coaters, like many A England polishes. Are you picking up any of the colours from this collection? Adina has yet another WINNER!! She does it every time. Thank you for highlighting this beautiful collection!